Michael Dudley and Dorothy Howard took turns contributing to this lively 36 step renku from October, 1990 until July, 1993 (when we did these things by snail mail! ), then published the results with Dorothy’s seminal publishing house, proof press. All rights reserved. This book is republished here with the kind permission of the authors. 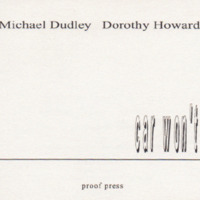 Dudley, Michael and Howard, Dorothy, “Car Won't Start,” The Haiku Foundation Digital Library, accessed April 19, 2019, http://www.thehaikufoundation.org/omeka/items/show/176.